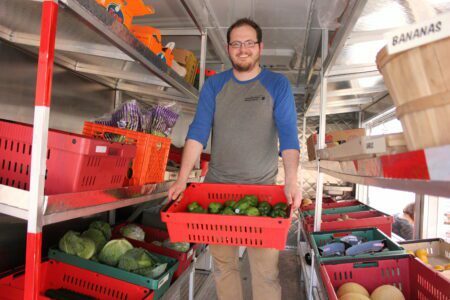 Green Grocer is a mobile farmers market that is designed to travel into food desert communities to provide the fresh food options that are currently missing from the landscape. By selling fresh, healthy foods at an affordable price Green Grocer will help to alleviate food inequity by creating access. Everyone is welcome to shop at the market and we accept multiple forms of payment, including SNAP/EBT and FMNP/SFMNP checks. Green Grocer makes 14 market stops every week in 14 different neighborhoods. Food deserts are defined as neighborhoods that do not have ready access to fresh, healthy, affordable food. Food deserts are communities that lack things like grocery stores, farmers markets, and other healthful food options. For every $2 a customer spends at Green Grocer using their SNAP/EBT card they will get a $2 coupon back that can be used at Green Grocer or Just Harvest farmers markets. For every $5 FMNP/SFMNP check that a customer spends at Green Grocer they will get a $5 coupon back that can be used at Green Grocer markets.